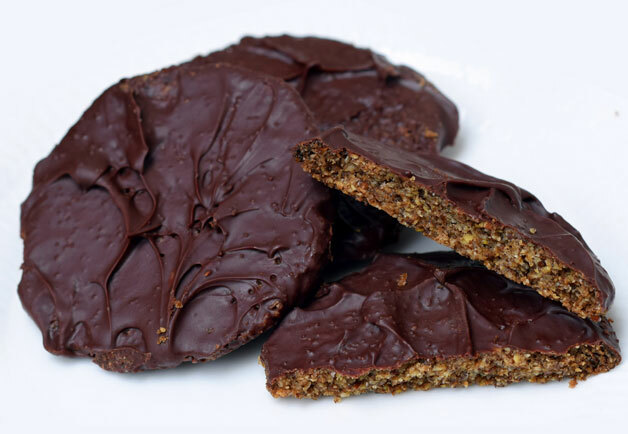 This recipe is a low-carb version of chocolate digestive biscuits. In Britain, digestive biscuits are a national treasure loved by everyone. If you are not from England, they are semi-sweet biscuits with fibery texture, traditionally made with wholemeal flour. The name “digestive” dates back to 19th century, when these biscuits were believed to have antacid properties because they contain sodium bicarbonate. They are great for dunking in your tea, and are often crumbled for use in other recipes, for example, cheesecake base. I think they might be similar to Graham crackers in USA but I am not sure (if anyone knows, please leave a comment below and let us know). You can get plain versions of these, and chocolate covered versions. I am of course going for the latter! I started looking into low-carb versions of digestive biscuits when working on my cheesecake recipes. After much experimenting, I think a mixture of ground almonds and [flax-linseed-US] creates a convincing substitute for brown flour and bran. Biscuits come out with a fibery taste and coarse texture similar to the real thing. I tend to use a mixture of erythritol and Stevia in most of my low-carb baking, such as Sukrin Plus or [arrowroot-US], other options could be guar gum or xanthan gum. These biscuits taste quite nice on their own, but you can also cover them in chocolate for a bit of extra oomph. I prepared my glazing using [chocolate-100-US](100% cacao solids), [cacao-butter-UK][cacao-butter-US] and [coconut-oil-US]. All of these ingredients are solid at room temperature, so once cooled, they create an additional strong layer to hold the biscuits shape in place. Everyone’s oven is different. I have learned this the hard way. So the temperature provided in the recipe is for guidance only – please keep checking your biscuits and take them out when they are golden, before they start turning too dark. 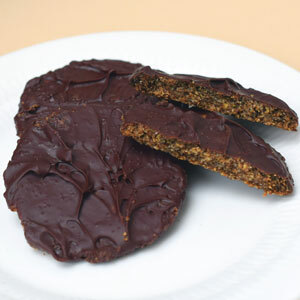 Low-carb version of classic British biscuits, using flax, almond flour and sugar-free chocolate. Just found your website and I am very excited to have some recipes for traditional British foods. My Husband is from the UK and has lost 70 lbs on a low carb diet, we have completely changed the way we cook and eat. This recipe is one I want to try immediately! You are correct in assuming digestives are similar to graham crackers in the US, but of course in the US they are much sweeter. Graham crackers have a reputation here as only for children, because they are usually one of the first cookies (biscuits) mothers give to toddlers. Thank you so much for this positive feedback, and for explaining about Graham crackers. I hope the recipe turns out well for you – please let me know how it goes. 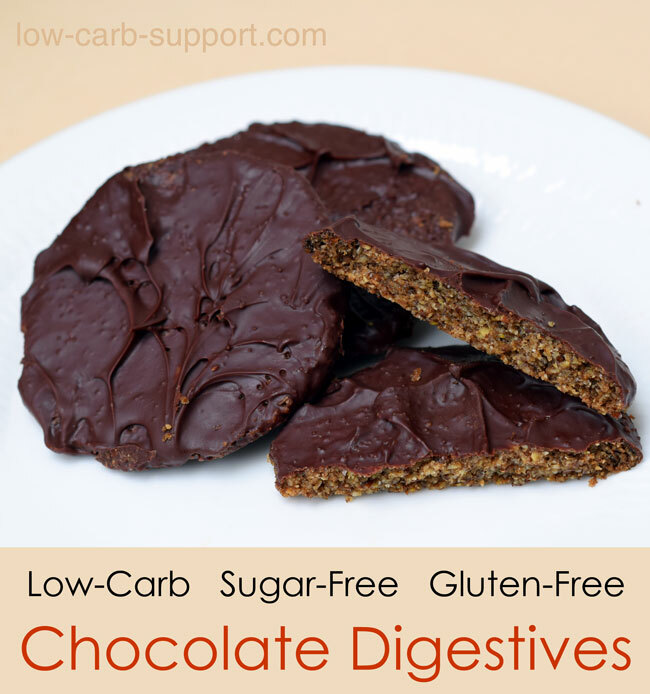 I’ve been looking for a good old digestive biscuit in a low carb form. Can’t wait to try these will leave some of them uncoated as I like digestive biscuits with Stilton cheese. Thanks for the recipe. I hope they turn out well and help to fill the gap! I like your thinking about Stilton cheese – will try it out. Best of luck! Can you tell me how many calories and carbs a biscuit has without the chocolate glazing? Arrowroot is a still a carb product. In fact, due to the lack of gluten, a protein, it has an even worse carb-to-good-stuff ratio and is more unhealthy. You could (but shouldn’t) as well just use regular flour. How about using plain old egg (yolk/white?) for holding things together? It works well in many things. And please do not use coconut anything in chocolate. Otherwise it is not chocolate anymore. Plain old cocoa butter tastes better, is more healthy, and has better properties. Also, given the availability of nuts, dried/roasted beans, fruit and vegetables that can be eaten without preparation (like carrots, apples, paprika, …), dried meat (like a whole ham, salami, other dried sausages), cheese, etc, I don’t really see the point of clinging to candy. It can help, as a substitute, like methadone or e-cigs, to make reducing one’s intake easier. But the goal should be to not have an urge for any crack analogy at all. A better solution would be, to not eat as much salt, to prevent the itch from coming up in the first place. And to never let the energy levels go down so much too. I don’t even want to eat any sweet stuff. Why would I, when I have much better stuff? Yes, of course, I agree it is best to break off the addiction to sweet things completely. If you managed to do this, then bravo to you. But unfortunately, most people do struggle with this. So if someone is on the brink of giving up the diet because of sugar cravings, it is better for them to have a low-carb dessert, than fall off the wagon and go back to real sugar. Thanks, I do agree with you regarding arrowroot, but since only a very small amount is required, I do use it sometimes. Also agree regarding cocoa butter – but coconut oil is a more common ingredient which is easier to buy. Wow!! I’ve loved those biscuits! Can I use Psyllium husk powder ? Since it is only 1 tsp., will it make a big difference if I don’t add the arrowroot? Hi, although it’s only a small amount, arrowroot acts as a thickener which is essential in this recipe. You can substitute it with a different thickener, such as guar gum or xanthan gum. I am afraid you can’t just leave it out though, as the dough will likely just crumble away without it, so I wouldn’t recommend it. (It’s a bit like raising agents such as baking soda – you only need 1 tsp but you can’t leave it out without destroying the texture). I can’t wait to try this!! Digestives were my favorite cookies growing up….just dip them in tea with cream….delish!! !